Crohn's disease (CD) progression is marked by the occurrence of stricturing complications or intestinal and perianal penetrating complications, typically requiring surgery.1 ,2 We previously reported three factors at the time of diagnosis that increased the chance of disabling disease during the 5 years following: (1) age <40 years old, (2) presence of perianal lesions and (3) the requirement for steroids to control the first flare.3 However, as the median age of diagnosis is 27 years, the course of CD may last more than 50 years in the Western world, where the life expectancy of patients exceeds 70 years. Therefore, identifying predictive criteria throughout such a long period remains challenging. We believe the assessment of CD severity should not be skewed by only taking into account occasional disease events.4 For example, one patient may be operated on once and then experience a long period of quiescent disease. CD manifestations are often quite active during the early few years before subsequently resolving and becoming more stable.5 One may consider a CD complication as an acute phenomenon without recurrence,6 and, in the absence of significant sequelae, such an event should therefore not be regarded as a marker of severe disease. Notably, most therapeutic strategies aim to avoid short-term complications; however, CD is a chronic disease requiring lifelong monitoring. Very little is known about the long-term evolution of CD. Therefore, the aim of our study was to identify predictable factors associated with a mild-to-moderate, long-term CD course; for this purpose, we prospectively analysed a large cohort of patients with CD over 15-year period. Patients with complete 15-year follow-up records were selected from the MICISTA Registry. This tertiary clinical database of more than 7000 patients with inflammatory bowel disease (IBD) evaluated by the same staff of doctors at Rothschild hospital (1974 to 2002), then St-Antoine hospital (from 2003 through the present) in Paris (built in 1994). Data were collected prospectively. CD diagnosis was based on the criteria defined by Lennard-Jones.7 In March 2010 there were 4306 patients with a final diagnosis of CD in the registry. Among this population, 600 patients with CD were seen in our unit during 1995 and were followed through to December 2009, or death. They represent 67% of the total number (899) of patients with CD seen in our unit at that time. Characteristics of patients were recorded in the MICISTA registry according to the medical charts before 1994 and prospectively from 1995 onwards. Disease location was assessed prior to inclusion in the study by the most recent small bowel images (x-ray) and endoscopic features. The extent of previous intestinal resections in each individual was codified using the Post-Surgical Handicap Index. The Post-Surgical Handicap Index has been developed to predict the functional consequences of intestinal resection for CD.8 It is calculated from operative records, taking into account the location and extent of intestinal resection. An index score equal or superior to 20 has a high predictive value of diarrhoea following intestinal resection. Disease activity was codified prospectively at each visit or hospitalisation for every calendar year according to a pre-established gradation from 0 to 5 (table 1). Disease activity was recorded during hospitalisation only when symptoms were clearly related to active CD and not treatment-related complications. Similarly, only intestinal surgery or proctological procedures performed for CD were taken into account and codified in the hospitalisation group. In addition, restorative procedures performed in a patient with inactive disease were not included in the grading. Finally, a stoma was considered permanent if associated to a proctectomy or still in place in 2009 after 5 years (consecutively). In the absence of a well established classification system, a panel of 20 IBD experts from the ‘Groupe d'Etudes Thérapeutiques des Affections Inflammatoires du tube Digestif’ (GETAID) was interviewed to establish the most relevant criteria for discriminating a severe from a mild-to-moderate CD course during a 15-year period. The proposed criteria were the following: (1) number of years with active disease, (2) chronic, disabling extraintestinal manifestations, (3) number of intestinal surgeries, (4) disabling perianal disease, (5) number of perianal surgical procedures, (6) requirement for a temporary or permanent stoma and (7) death related, or not, to CD. Each expert codified items independently. 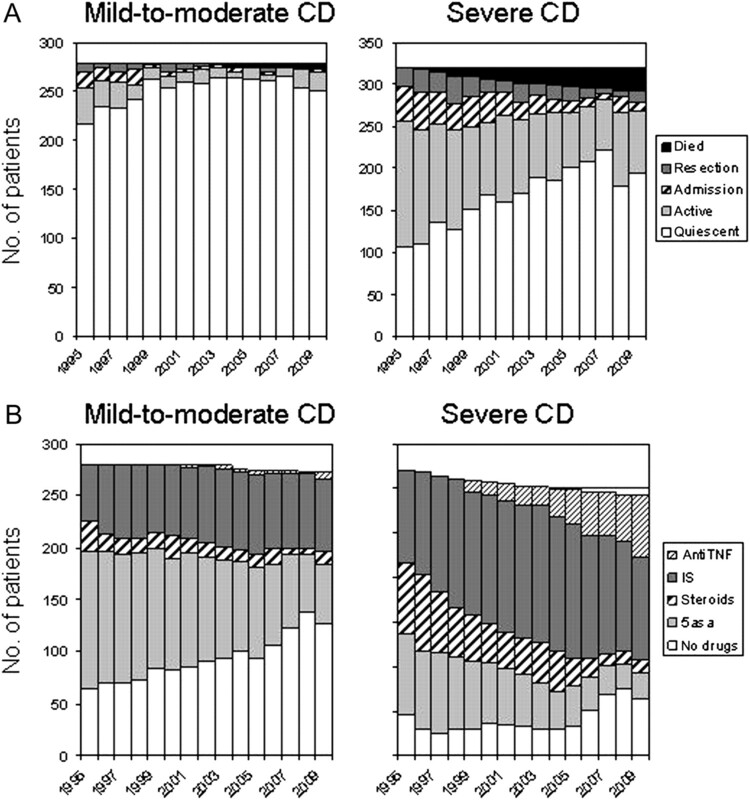 A consensus emerged for classifying the evolution of CD as severe if during the 1995 to 2009 period one of the following criteria was met: (a) active disease (ie, grade >1), for more than 3 years consecutively or not; (b) more than one intestinal surgery; (c) establishment of a permanent stoma; (d) death related to CD or complications of CD, or complications of CD treatment. The evolution was considered as mild-to-moderate in all other cases. Disease flares were treated with mesalamine (3–4 g daily) or steroids (prednisolone 1 mg/kg per day, or budesonide 9 mg per day, each progressively tapered after 4 weeks), according to their clinical severity. When steroid treatment failed or was contraindicated, patients seen before 1999 were given enteral or parenteral nutrition; those seen after June 1999 received Infliximab. Adalimumab was used as a second-line anti-tumour necrosis factor (TNF) treatment after 2006. Metronidazole or ciprofloxacine were used in symptomatic perianal disease. Patients with asymptomatic or moderately active forms of the disease were treated with aminosalicylates (1.6–3 g daily). Immunosuppressive drugs were used in patients that were steroid dependent or poorly responsive to steroids. Azathioprine (2 mg/kg per day) was preferentially used as the immunosuppressive drug, and increased to 2.5–3 mg/kg per day if needed. Intramuscular methotrexate (15–25 mg, weekly) was used in patients unresponsive or intolerant to azathioprine. In cases of controlled CD, methotrexate was tapered after 3–6 months to 10–15 mg, weekly. In cases of poor responses to classical immunosuppressants, anti-TNF therapies were used for maintenance. Although the overall strategy remained mostly unchanged, there was a distinct tendency to initiate immunosuppressants earlier in the disease course.9 Surgery was performed for stenotic complications, extraparietal complications, or intractable forms of CD after well conducted medical management. The maximum treatment received by one patient during each calendar year was codified prospectively at each visit/hospitalisation, according to a pre-established gradation (0–5 (table 1)). All treatment(s) were taken into account, even in cases of short duration. Statistical comparisons were performed using χ2, Fisher's exact, Student t test or Wilcoxon test where appropriate. Identification of factors associated with mild-to-moderate, 15-year CD course was determined by using univariate and multivariate analyses. Most covariates were collected in 1995: age, gender, family history, educational level, obesity, disease duration, disease location according to Montreal classification (ie, at first surgery or in 1995 in patients who had not be operated upon), rectal involvement, perianal disease, systemic manifestations, prior intestinal stricture (Montreal classification), prior intestinal perforation (Montreal classification), prior perianal fistula, prior intestinal resection, prior immunosuppressive treatment and current immunosuppressive treatment. Three variables were collected at the end of the follow-up: (1) quality of follow-up care (how many visits per year), (2) any use of oral contraceptives during their lifetime and (3) active smoking during the 15-year study. The smoking variable was qualified by more than one cigarette per day for at least 1 year. Statistically significant covariates (α=5%) in univariate analyses were included in a stepwise logistic regression (entering effect =0.10, removing =0.05). The goodness of fit for the final multivariate model was assessed with the Hosmer and Lemeshow test. The power of the model's predicted values to discriminate between severe and mild-to-moderate cases was quantified by the area under the receiver operating characteristic (ROC) curve (AUC). Statistical analyses were performed using SAS software V.9.1 (SAS, Cary, North Carolina, USA). The 15-year CD course was classified as mild-to-moderate in 279 of the 600 patients. Among them, all the patients experienced at least 12 years with no active disease, except six patients who died before 2010. Those six patients were classified as mild-to-moderate because four of them died after a period of 9–10 years of CD remission, and two of them died after only 1 year with active disease during the 10–12 previous years. A total of 61 patients (22%) were operated on once during the 15-year period for active or complicated CD. The other 321 patients were classified in the severe CD group because of active disease for more than 3 years (n=286), at least two abdominal operations for active or complicated CD (n=58), the establishment of permanent stoma (n=42), or death related to CD (n=23). Tables 2–4 give the clinical characteristics of the two groups in 1995, at the end of follow-up and through the 15-year study, respectively. In the entire cohort of 600 patients, 6288 patient-years with inactive disease existed (grade 0–1; 72.2%), 1641 patient-years with flare or chronic active disease not requiring hospitalisation existed (grade 2 or 3; 18.8%), 453 patient-years with hospitalisation without abdominal surgery existed (grade 4; 5.2%) and 344 patient-years with abdominal surgery existed (grade 5; 3.9%). Disease activity during the calendar years 1995 to 2009 in mild-to-moderate and severe CD is indicated in figure 1A. A significant trend towards lower disease activity is observed during the most recent years in severe and mild-to-moderate CD groups. When taking into account the entire cohort, the percentage of patients with active disease decreased linearly over the years from 43% to 14% (p<0.001). In the mild-to-moderate CD group, the proportion of patient-years with active disease was 14.8%, 6.7% and 5.6% during the periods 1995 to 1999, 2000 to 2004 and 2005 to 2009, respectively (p<0.001). The proportion of patient-years with active disease in the severe CD group decreased from 60% (1995 to 1999) to 42% (2000 to 2004) and 32% (2005 to 2009) (p<0.001). Year-by-year disease activity and maximal treatment from 1995 to 2009 in the two groups of patients with Crohn's disease (CD). (A) Year-by-year disease activity from 1995 to 2009. (B) Year-by-year maximal treatment from 1995 to 2009 in the two groups of patients with CD. In mild-to-moderate CD the percentage of patients with active disease each calendar year varied between 22.2% (1995) and 2.9% (2007) (median, 9.3% in 2001). Hospitalisation and surgery were required in few patients, and these events almost exclusively occurred during the early years of the study (1995 to 1999) (figure 1A). In severe CD the percentage of patients with active disease each calendar year varied between 67% (1995) and 25.1% (2007) (median, 43.2% in 2002). The annual rate of hospitalisation, excluding abdominal surgery, varied from 13.4% (1996) to 2.7% (2007) (median, 7.3% in 2002) and the annual rate of abdominal surgery varied from 10.6% (1998) to 2% (2007) (median, 5.5% in 2000) (figure 1A). The number of patients with CD in the mild-to-moderate and severe groups who received 5-aminosalicylic acid (5-ASA), steroids, immunosuppressants and anti-TNF treatment as maximal treatment are indicated for each calendar year in figure 1B. In both groups a gradual increase in the use of immunosuppressants and anti-TNF treatment is observed over time. The proportion of patient-years in which immunosuppressants and/or anti-TNF treatment were used in mild-to-moderate CD increased from 23.2% (1995 to 1999) to 26.4% (2000 to 2004) and finally to 27.8% (2005 to 2009) (p<0.001). In severe CD, these figures were 41.2%, 56.2% and 62.1%, respectively (p<0.001). Trends in both groups exhibited a coincident decrease in 5-ASA and steroid usage as the maximal treatment over time. As the use of 5-ASA and steroids in association with immunosuppressants was not reported, the observed decrease in the proportion of patients taking 5-ASA or steroids cannot be interpreted. Finally, there was a significant increase in the percentage of patients receiving no medical treatment over time, notably in the most recent years. This trend was more marked in the mild-to-moderate CD group (from 25.9% in 1995 to 1999 to 43% in 2005 to 2009, p<0.001) than in severe CD (from 10.2% in 1995 to 1999 to 19.9% in 2005 to 2009, p<0.001). In total, throughout the 15-year period, 116 patients with mild-to-moderate CD (41.6%) eventually received immunosuppressants and 14 received anti-TNF treatment (5%). In the severe CD cohort, 268 (83.5%) patients received immunosuppressants and 97 (31.4%), received anti-TNF treatment. Table 5 indicates the variables selected by univariate analysis which entered the multivariate model. After adjustment for confounding, significant factors associated with a mild-to-moderate 15-year disease course were the following: (1) non-smoking, (2) higher educational level, (3) rectal sparing, (4) older age and (5) longer disease duration prior to inclusion. The model was a good fit to the data (Hosmer and Lemeshow: p=0.51). The area under the ROC curve was 0.69. The probability of a mild-to-moderate course was given by the following formula: logit(p) =−0.8715+0.0148×age (years)+0.0479×disease duration (years)−0.3992×ever smoking (0 or 1)−0.4503×rectal involvement (0 or 1)+0.3915×high educational level (0 or 1). This model demonstrates that a 15-year time course increased the probability of having subsequent mild-to-moderate disease by 0.208±0.032. This increased probability was similar when analysing patients with mild-to-moderate (0.201±0.039) and severe disease courses (0.214±0.024). Table 6 indicates the respective contribution of each selected variable to the different criteria used for defining CD severity. Neither CD-related death nor the surgical criteria (more than one abdominal surgery) were significantly associated with any selected variable. However CD activity was associated with the five selected variables, and the establishment of a permanent stoma was associated with rectal involvement and lower educational level. The present study shows that long-term prognosis of CD is not related to anatomical characteristics of the disease, except for rectal involvement. Smoking and low educational level are associated with a more severe disease course. In addition, this study demonstrates that age and disease duration are associated with a less severe course. To date, our study is unique in the literature with regard to the number of patients, the prospective collection of data and the management of the study by a small, consistent group of doctors. Compared to population-based studies, referral-based cohorts, such as our cohort, enrol younger patients with more fistulas, steroids and immunosuppressant use.10 This recruitment bias may lead to an overestimation of patients with severe disease but does not compromise the comparisons drawn between severe and mild-to-moderate CD. Thus, the proposed prognostic factors should be validated in independent population-based cohorts. The long-term harmful effect of smoking in CD was once again confirmed in our cohort. Of note, smoking was associated with increased disease activity but not with a need for a second operation (table 6).19 ,20 The beneficial effect of a higher educational level was somewhat unexpected, particularly because, in France, level of education has no impact on access to health resources.21 However, educational level may inadvertently affect compliance22 and, indeed, non-adherence has been reported in over one-third of patients taking maintenance therapies for inflammatory bowel disease which may negatively contribute to CD management.23 ,24 Better compliance may be achieved in patients with CD with a lower educational level through enrolment in a patient association.21 ,25 Furthermore, a high educational level may be linked to a more cautious lifestyle behaviour and somehow protect patients with CD from environmental triggers. Disease duration and age at inclusion in the study were both independent factors associated with a lesser severity of CD. The beneficial effect of time was not related to prior intestinal resection (table 5). We calculated from the logistic regression model that a 15-year lag time decreased the probability of having a subsequent severe course by approximately 20%. To our knowledge this is the first study demonstrating that, time is an independent factor for lower CD disease activity. The IBSEN study12 demonstrated a greater likelihood of prolonged remission was associated with patients over 40 years of age. However, the landmark study by Munkholm et al5 showed that the initial 3 years following diagnosis are the most active and should be considered separately for these analyses. In the latter study, a remarkably constant percentage of patients (55%) were classified in clinical remission each year after the initial 3 years after diagnosis.5 However, more than 15 years after diagnosis, there was a higher proportion of patients changing from active to remission status than vice versa each year.5 In addition, our study shows, through year-by-year analysis of CD activity, the positive effect of disease duration and was more marked during the more recent years (figure 1A). When analysing our cohort excluding patients with <3 years of disease evolution before entering the cohort (n=159), we found similar results (data not shown). In mild-to-moderate CD, percentage of patients with active disease decreased over the years and a large cohort of patients was relieved of treatment while no de-escalation protocol was currently followed. Similarly, in severe CD cases, there was also a higher proportion of patients without any treatment. The proportion of patients under immunosuppressants (comprising steroids and anti-TNF) did not change over years. Thus, it is probable that the decrease in disease activity observed over the years in the study was poorly related to the treatment regimen, but was the consequence of a natural waning of disease. Taken together these data support the conclusion that overall CD activity declines over time, albeit in a limited magnitude. Finally, long-term evolution of CD is weakly predictable. New approaches using biomarkers to predict disease course are needed.26 ,27 Moreover, about one-half of the patients from a referral centre will have a mild-to-moderate, long-term evolution and this proportion should be kept in mind when considering treatment strategies. In addition, among factors associated with a severe evolution of CD, smoking remains the most challenging factor for patients to overcome. Lastly, rectal disease should receive major attention in order to decrease permanent stoma, and, moreover, efforts should be attempted to better understand CD progression. We express our gratitude to all doctors of Rothschild and St-Antoine hospitals who were involved in the care of patients included in this study, in alphabetic order: Pauline Afchain, Philippe Baumer, Jérôme Bellanger, Antoine Blain, Franck Carbonnel, Stéphane Cattan, Jean-François Contou, Hélène d'Almagne, Daniel Evard, Jean-Pierre Gendre, Philippe Lamy, Yves Le Quintrec, Yann Ngo, Didier Reijasse, Virgine Sebbagh, Ariane Vienne.
. Long-term evolution of disease behavior of Crohn's disease. Inflamm Bowel Dis 2002;8:244–50.
. Behaviour of Crohn's disease according to the Vienna classification: changing pattern over the course of the disease. Gut 2001;49:777–82.
. Predictors of Crohn's disease. Gastroenterology 2006;130:650–6.
. Clinical course and costs of care for Crohn's disease: Markov model analysis of a population-based cohort. Gastroenterology 1999;117:49–57.
. Disease activity courses in a regional cohort of Crohn's disease patients. Scand J Gastroenterol 1995;30:699–706.
. Perforating and non-perforating indications for repeated operations in Crohn's disease: evidence for two clinical forms. Gut 1988;29:588–92.
. Classification of inflammatory bowel disease. Scand J Gastroenterol 1989;24:2–6.
. Classification of the sequelae of bowel resection for Crohn's disease. Br J Surg 1994;81:1627–31.
. Impact of the increasing use of immunosuppressants in Crohn's disease on the need for intestinal surgery. Gut 2005;54:237–41.
. Crohn's disease patient characteristics in a tertiary referral center: comparison with patients from a population-based cohort. Eur J Gastroenterol Hepatol 2005;17:395–401.
. Intestinal perforation in Crohn's disease. Factors predictive of surgical resection. Gastroenterol Clin Biol 2005;29:1105–11. ; IBSEN Study Group. Clinical course in Crohn's disease: results of a Norwegian population-based ten-year follow-up study. Clin Gastroenterol Hepatol 2007;5:1430–8.
. Risk of early surgery for Crohn's disease: implications for early treatment strategies. Am J Gastroenterol 2003;98:2712–18.
. Risk factors for surgery and postoperative recurrence in Crohn's disease. Ann Surg 2000;231:38–45.
. Toward an integrated clinical, molecular and serological classification of inflammatory bowel disease: report of a working party of the 2005 Montreal world congress of gastroenterology. Can J Gastroenterol 2005;19:1A–32A.
. Perianal Crohn's disease: classification and clinical evaluation. Dig Liver Dis 2007;39:959–62.
. Prospective study of the features, indications, and surgical treatment in 513 consecutive patients affected by Crohn's disease. Surgery 1997;122:661–7; discussion 667–8.
. Surgical treatment of anoperineal Crohn's disease: can abdominoperineal resection be predicted? J Am Coll Surg 1999;189:171–6.
. Smoking and disease recurrence after operation for Crohn's disease. Br J Surg 2000;87:398–404.
. Crohn's disease patients who quit smoking have a reduced risk of reoperation for recurrence. Am J Surg 2004;187:219–25.
. Socioeconomic deprivation does not influence the severity of Crohn's disease: results of a prospective multicenter study. Inflamm Bowel Dis 2009;15:594–8.
. Disease-related knowledge in inflammatory bowel disease: experience of a tertiary care centre in a developing country in South Asia. Singapore Med J 2010;51:484–9.
. Patients' attitudes to medicines and adherence to maintenance treatment in inflammatory bowel disease. Inflamm Bowel Dis 2009;15:837–44.
. Medication-taking behavior in a cohort of patients with inflammatory bowel disease. Dig Dis Sci 2006;51:2165–9.
. Socioeconomic and psychological factors associated with nonadherence to treatment in inflammatory bowel disease patients: results of the ISSEO survey. Inflamm Bowel Dis 2011;17:1270–6.
. Combination of genetic and quantitative serological immune markers are associated with complicated Crohn's disease behavior. Inflamm Bowel Dis 2011;17:2488–96.
. Increased immune reactivity predicts aggressive complicating Crohn's disease in children. Clin Gastroenterol Hepatol 2008;6:1105–11. Funding This work was supported by a research grant support from Abbott. The MICISTA database was adapted to the internet with funding from Association François Aupetit. Disclosures JC received consulting fees from Abbott, LB received consulting fees from Abbott, PS received consulting fees from Ferring and Biocodex, The remaining authors state they have no conflicts. Ethics approval CNIL (Commission Nationale) n 1 104 603. Data sharing statement JC had the leadership in study design and had full access to all of the data in the study. He takes responsibility for the integrity of the data and the accuracy of the data analysis. The statistical analysis of the entire data set was performed by two independent biostatisticians, Flavien Roux and Frederic Mistretta (RCTs, Lyon, France). The natural history of Crohn's disease: who holds the crystal ball?